Sign up for your Ducks Dine On plan today! Ducks Dine On is a meal plan for UO faculty, staff, and students living off campus. The Ducks Dine On plan provides a discount on meals at all nine of the University Housing dining locations. With Ducks Dine On, you use your meals by scanning your UO ID card at the dining venues. For example, at Carson Dining, which offers all-you-care-to-eat dining, you swipe your UO ID card as you enter and one meal is deducted from your plan. In all other à la carte venues, a meal is five points. You can shop for the items you want for up to five points, pay the cashier using your UO ID card, and one meal will be deducted from your plan. Ducks Dine On is available throughout the year. Ducks Dine On meal points are good for a one-year period beginning September 1 and expiring on August 31. Only Carson and DUX Bistro accept Ducks Dine On during the summer. During the academic year, points can be redeemed at any dining venue. Who qualifies for the plan? Anyone with a UO ID card. It’s easy! Complete the quick application and submit your payment online. We accept Visa, Mastercard, and Discover. Students may also choose to have it billed to their student account. What does a “meal” mean? Meals can be used for an all-you-care-to-eat meal in Carson Dining or up to five points at any location. Purchases must be equal to or less than five points per meal, but you may purchase multiple five-point meals in one transaction. Anything over five points will be charged as an additional meal. For example, a Big Mouth Burrito at Hamilton Dining is four points and a drink is one point, so that would be a five-point meal. A rice bowl with your choice of chicken, curried vegetable or tofu, and three vegetable sides at Fresh Marketcafé in the Global Scholars Hall is four points. Add a yerba mate tea or brewed coffee for one point to make a five-point meal. You could treat yourself and a friend or colleague to coffee and a pastry or cookie (many coffee drinks are one or two points, and many cookies and pastries are one or two points). A large salad at DUX Bistro in the Living-Learning Center is a five-point meal. A large sushi bento box is a five-point meal. It’s easy to mix and match items and create a meal out of five points. We recommend that if you are using your plan at our à la carte venues to get items for less than five points, that you supplement your purchase with other items (i.e. a piece of fruit, snacks to take with you for later, etc.) to get the full value of your meal. What if I need more meals? You may upgrade your plan and purchase additional meals at any time. The more meals you purchase, the greater the discount. When do my meals expire? Ducks Dine On plans begin on September 1 and expire on August 31 each year. The Golden Mug bonus expires on August 31 as well. Ducks Dine On meal plans are non-refundable. Ducks Dine On Plus -Add Duck Bucks to your Ducks Dine On plan! Add $100 to any plan and receive $115 in Duck Bucks value added to your UO ID card. Duck Bucks has added flexibility in that it can be used just like cash at all food venues in the EMU and residence halls. Whether you want to have lunch, get some great concert tickets, or grab a cup of coffee while studying late at the library, Duck Bucks make on-campus purchases easy and convenient. Ducks Dine On Plus plans may not be charged to your student account. For a full list of locations that accept Duck Bucks, ways to make additional deposits, terms and conditions, or to check your Duck Bucks account balance go to emu.uoregon.edu/duck-bucks. In addition to the excellent meal price, we give you a golden mug if you purchase the 100 meals plan. You can fill your mug up any time for free. 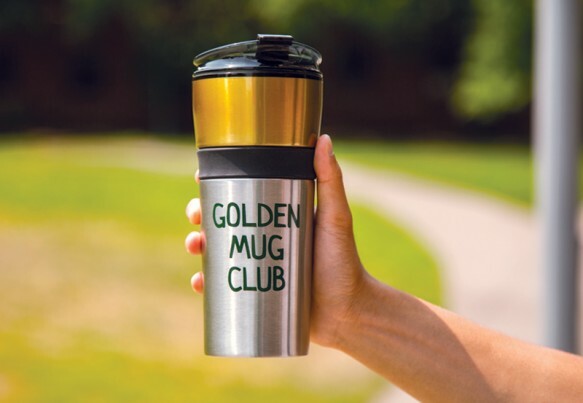 Just bring your golden mug (or any other reusable cup that is equally sized) to any of the residential dining venues, except Carson Dining, fill it up (soda, tea, or brewed coffee) as much as you like, swipe your card, and enjoy!